Within the family, you need to teach your children that God made us all different. Through the years as the kids were growing up, I would never let the older kids say, “Oh, that is so easy!” when a younger sibling was struggling with their work. I would tell them it wasn’t as easy for them when they were younger, and even if it was a subject they excelled in there were things they struggled with, too. It wasn’t right to make a younger sibling feel “dumb”. When we learn to appreciate each person, we can better begin to help each one with the special “missions or exploits” God has given each to do. As I learned to teach to the passions of each child, the other children would also come to see how each one did really have special areas of interest and how God had equipped them with natural talents or personality to accomplish those interests. Our goal should be to cultivate a kind of “team spirit” in our kids. When one child is exploring his passion in a certain pursuit, everyone else can chip in with ways God has gifted them to help each other accomplish their goals. Team spirit, or rather, family cohesiveness is learned as your family takes on projects to serve others. Whether you are taking your little ones by the hand and showing them how to serve an elderly person or a mom with a new baby or as you join your older children in projects they attempt, the closeness of your family is a natural byproduct. Even as my children have grown to adulthood and established families of their own, they still are each other’s best friends. When one is involved in any project, such as buying and fixing up an old house, or campaigning for a good candidate, or bringing meals to a family under stress or watching the kids to give them a break, and so on, everyone else chips in and helps them out. Their loyalties are strong and their tendencies are to look for ways to help each other when a need arises. 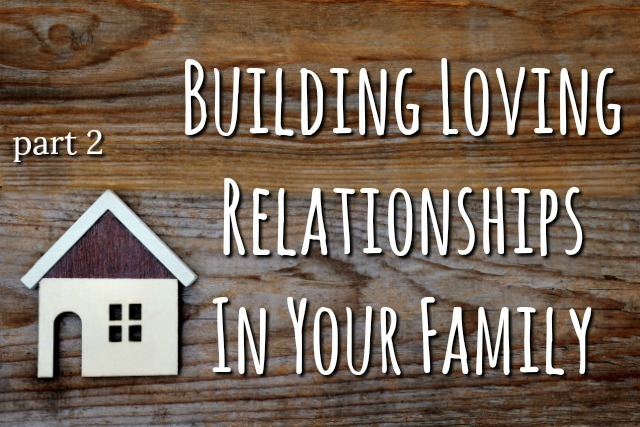 This entry was posted in Building Loving Relationships Within Your Family, Family Relationships, Parenting and tagged brothers and sisters, character concepts, family relationships, home life, how to make my kids like each other, marilyn boyer, rick boyer, sibling rivalry by Marilyn. Bookmark the permalink.